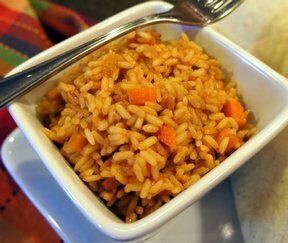 Tasty Mexican rice full of flavor from the vegetables. 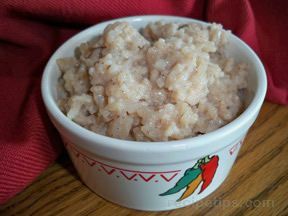 Fresh tomatoes make this rice extra special with just the right hint of spice from the Serrano chili. Cut the tomatoes in half, and remove the seeds. Add the tomatoes and 2 cups of stock to a blender and puree. Strain into a bowl and reserve the liquid. Add enough extra stock to make 4 cups of liquid. In a large saucepan, heat the oil over medium-high heat. Add the onion and carrots and sauté for 4 minutes until the onion is translucent. dd the garlic and sauté for 1 minute. 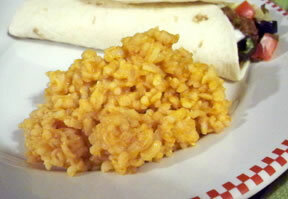 Stir in the rice and cook until slightly toasted, about 3 minutes. Add the tomato stock mixture, stir and bring to a boil. Add the salt, bay leaf, and Serrano chili. Reduce the heat, cover and simmer until the rice is tender, about 20 minutes. Remove the pan from heat. If desired, scatter the peas over the top of the rice, cover and let the rice stand 5 minutes. Fluff with a fork, transfer to a serving bowl. 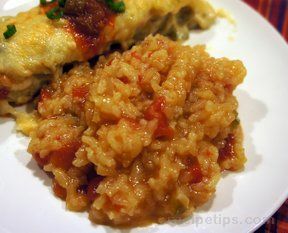 NOTE: If you want a deeper colored rice, stir in 2 Tablespoons of tomato paste when adding the salt, bay leaf and chili. "I loved the flavor in this rice. I used a jalapeno pepper since that's all I had. I also took a shortcut and used tomato sauce instead of the tomatoes. Great rice!"